Belfast runners prepare to take on 32 marathon challenge! 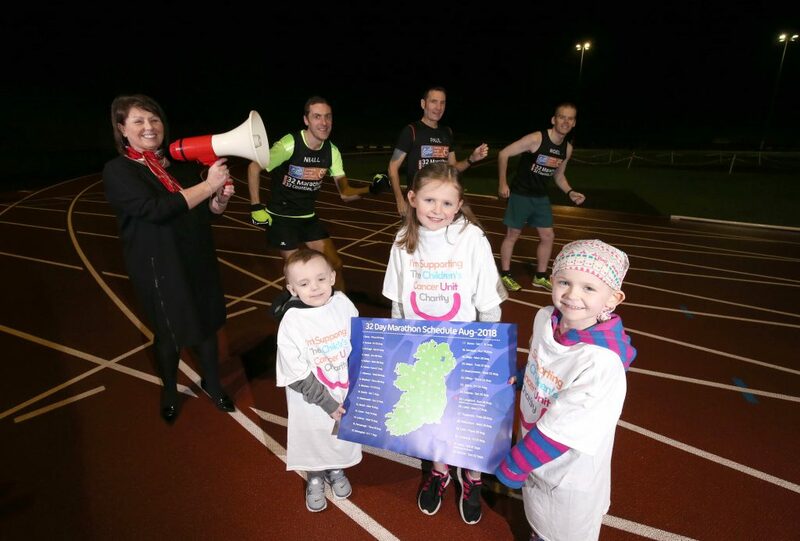 Three Belfast based runners are taking on the challenge of a lifetime this summer, and its all to raise funds for the Children’s Cancer Unit Charity to help children like Erin and Zak, both pictured. The haemotology unit in the Royal Belfast Hospital for Sick Children is the Regional Centre for treating children with cancer and the only place in NI where children can receive their treatment. The three runners, Noel McNally, Niall Farquharson and Paul Tyrell all belong to the Beechmount Harriers running club and they are in training to run 32 marathons on consecutive days, covering every county on the island of Ireland. The adventure will begin on the 2nd August and all being well finish at the Mary Peters Track in Belfast on the 2nd September. Noel McNally explained why the trio are taking on the unique challenge. “I know it sounds a bit crazy and there are a lot of logistical things to get organised, and that’s all before we pull on the runners and start the first marathon in few months time. 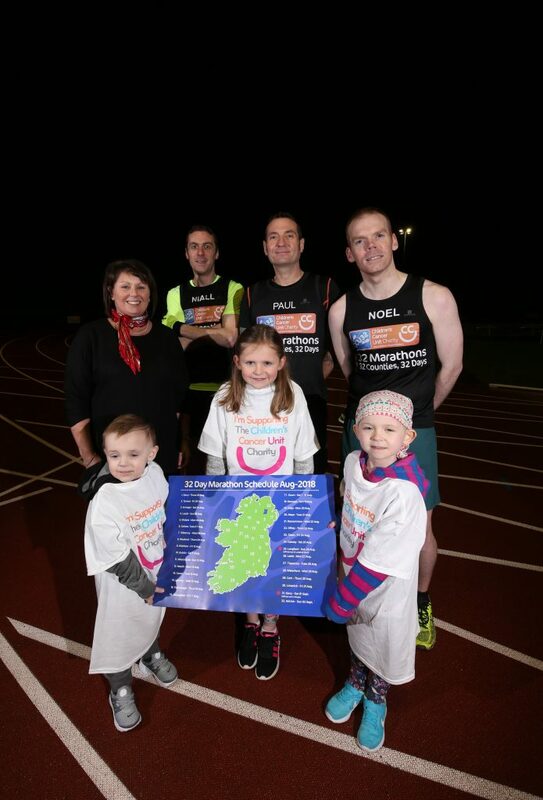 But we know we can call on the running community throughout Ireland and we will be relying on local volunteers to marshal our routes, time the runs and most importantly to join us for a day, even it is for a few miles, a half marathon or the full 26.2 miles. “Myself, Niall and Paul are committed to raising as much money as we can to support the work of the Children’s Cancer Unit Charity. We all know someone who has been affected by cancer and we know the amazing work undertaken by the staff at the unit. If we can help the Unit to help the families who need that help, then all the better. Jacqueline Wilkinson from the Children’s Cancer Unit Charity was on hand to wish the trio well on behalf of the charity. “We get fantastic support every year from fundraisers who really do take on some amazing challenges. This is one of the hardest I have heard of and I admire the lads for taking on this massive task. 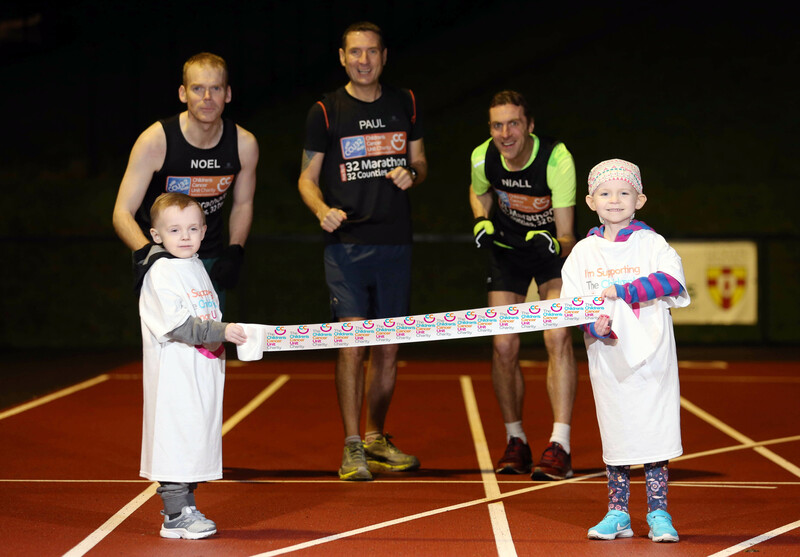 Runners Noel McNally, Niall Farquharson and Paul Tyrell and Jacqueline Wilkinson from the Children’s Cancer Unit Charity are joined by Erin and Zach who are both receiving treatment at the centre and Erin’s older sister Elena.